HCC has a long legacy of welcoming children and providing education, fellowship, and service opportunities for all ages. In an effort to meet the needs of parents today, we have created a Children’s Worship Space in the Sanctuary. We still provide a staffed nursery and a caring Sunday School experience. But any time children are in worship (for part or all of the service) we want children to feel welcome, a deep sense of belonging, and invited to participate in worship right along with their families. Our hope in creating a Children’s Worship space is that families will be able to worship together, each person actively engaged and participating as developmentally appropriate. We expect parents to sit with their children in this new area, helping their children worship as they are able, modeling their own faith in the process. Books, soft toys and art supplies are available for children to keep busy as they absorb the sights and sounds of the worshipping community. 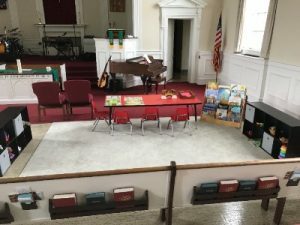 This area is up in front of the pews, so that children can see and hear and feel included and involved in our worship. Our hope is that HCC will continue to be warm and welcoming, and will continue to support children and families as they seek to grow in faith. The Children & Youth Ministry here at HCC is a growing, dynamic program that reaches out to the community to share the love of God for all people with a focus on children, youth and families. HCC provides a safe and nurturing environment where children are excited to learn and where parents are supported and helped in directing their children’s spiritual development. Our goal is to provide a loving atmosphere in which children of all ages can learn about and experience God’s love through a relationship with Jesus Christ. It is both an honor and a pleasure to provide a child-focused education time for the children. It is our intent for your child(ren) to hear and explore God’s word in a loving and nurturing environment. We feel privileged to serve the Lord in and through our Children’s Ministry program. Our Sunday morning education hour serves both parent and child by allowing parents the freedom to participate in church activities for their spiritual growth all the while nurturing the child in a loving, Christ-centered environment. Children of all ages are always welcome in our worship services. 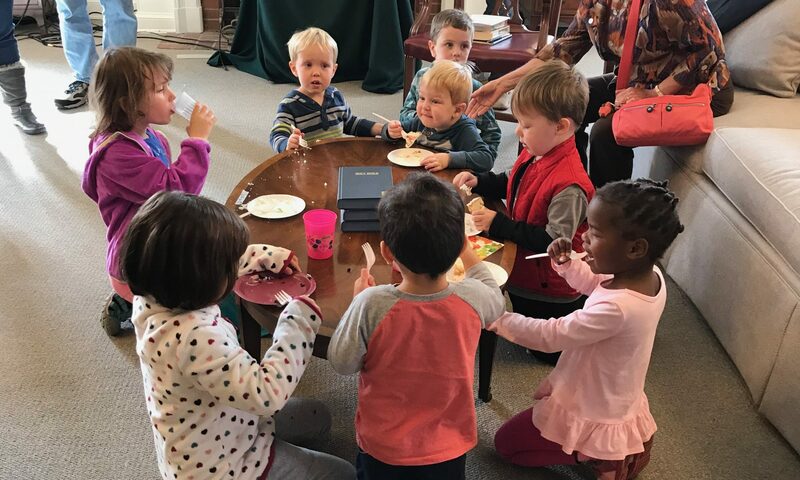 Parents may prefer that their infants and young children stay in the nursery with adult supervision and plenty of toys during the 10:00 a.m. worship service. Our nursery is open from 10:00 a.m. through 11:15 a.m. every Sunday. Children must be signed in to utilize the nursery services. Our Sunday School program offers classes for Kindergarten through fourth grade. Our classes meet during worship service, from 10:00 a.m. to 11:00 a.m. most Sundays (with the exception of Easter, Christmas and monthly Family Worship Sundays). We use a curriculum called “Shine” published by Bethren Press and MennoMedia, which uses wondering reflection questions and emphasizes spiritual practices and peace-keeping with every Bible-based lesson. Children are led to become familiar with the stories and truths of scripture, and taught to be thinking, questioning interpreters of scripture. Instruction focuses on Jesus’ teaching of the great commandments, loving God, and loving neighbor. Service to others is viewed as an integral part of what it means to be a Christian. Children, youth, and their families are actively engaged not only on Sunday mornings, but also through additional programming including our region’s summer camp program. Youth in grades 5-12 participate fully in our worship services and often serve in leadership roles, such as the diaconate, reading scripture, and sharing their musical and dramatic talents. We include children and youth fully in fellowship, outreach, and other congregational life and we believe they have gifts to share and voices to be heard. Second Hour (after worship) opportunities for learning and fun are offered frequently as well as events and activities at other times of the week. Many of our youth participate in our regional summer camp, Camp Christian. A new Drama Ministry especially with youth is being formed for chancel dramas, evenings of one-acts, and a spring musical. Young people (typically around the age of twelve) are encouraged and led to a transformational acceptance of Christ as their Lord and Savior. Instruction and development continue through high school and beyond helping youth find lifelong commitment to God’s service.